Storming the Nexus: Giving Heroes of the Storm a Try. There's no items and no last hitting. We level as a team, pay attention to objectives and also objectives change depending on the map you play. MOUNT UP WHEN NOT IN COMBAT!! These are but a few phrases my friend kept telling me as I made the transition from League of Legends (LoL) to Heroes of the Storm (HOTS). 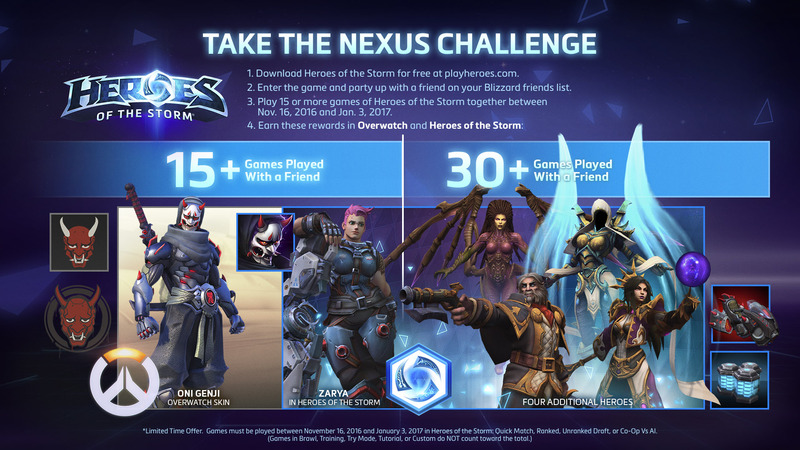 I'm super pumped to introduce my LoL friends to HOTS with the announcement of the Nexus Challenge cross-promotion. The promotion runs from Nov 15th until January 3rd and if you play 15 games with a friend, you'll earn a special skin for Genji in Overwatch. If you manage to play 30 games total with a friend, you'll earn a handful of other heroes, a special mount for use in HOTS and a gold & experience booster. I see it as a great opportunity to introduce people to this game by dangling the special skin as a reward for playing with your friends. 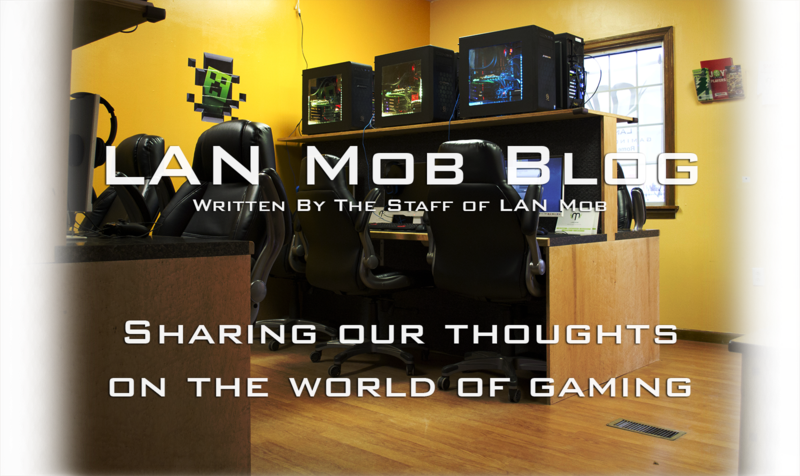 I'm a huge fan of MOBAs. I fondly recall many nights where friends and I would form 5-man teams in League of Legends and play hours on end while on a Skype call with one another. I feel I can't yet speak on the nuances of Heroes of the Storm due to my inexperience but the mechanical difference between HOTS and LoL caught me off guard. First off, there are no items to purchase and subsequently no "last-hitting" or landing the killing the blow on minions to get something. Instead, you progress by leveling up and taking "talents" or skill choices at certain levels. You gain a talent choice every 3 levels starting at level 1 (with the final talent being unlocked at level 20 taking 4 levels to reach). From what I've experienced, there are talents that augment your skills, your passive and offer activated abilities in addition to your skills. Some talents have "quests", which have you perform certain actions to empower that ability even further such as use a certain skill on Heroes X amount of times. Equally important but instead of each player having individual levels,you level as a team which is displayed at the top of the HUD. Experience is gained by being nearby when minions die, killing players, killing neutral camps or destroying towers and forts (bigger version of towers). There is not a jungle like that of league but there are areas between lanes where neutral monster spawn and can help destroy structures (Siege Camps) or help clear minions waves and fight Heroes (Bruiser Camps). There are also "Boss Camps" that act as your Baron where taking the camp can do anything from spawn an elite monster to help siege structures or help you with the map's objective (which I'll cover shortly). The towers & forts have ammo and will be unable to attack once they are run out, though they can regenerate ammo at a rate of 2 charger every 30 seconds. The enemy's core, similar to league's nexus, is what must be destroyed to win the game. Unlike in LoL, cores have a shield that regenerates and has the ability to attack heroes and minions with an unlimited supply of ammo in lieu of regenerating inhibitors and nexus turrets. What really captivated me from what little I've played so far is how there are multiple maps to play on, each housing a unique objective that you must play around accordingly. For example, "Warhead Junction" and "Braxis Holdout" are two Starcraft themed "battleground"/map yet are different in design. Braxis Holdout is a two-laned map where the objective is to fight for control over two beacons, located at the center of the map, that will activate periodically. When the beacons are active, both teams fight over control of the beacons which fills the controlling team's holding cell with Zerg. The progress each team has made towards filling their holding cell as well as who currently is on control of each beacon is displayed on the HUD. When either team reaches 100% progress, each team's collected Zerg will be unleashed to wreck havoc. Two important things to note: the holding cells are located at the top and bottom of the map.Control of these holding cells swap alternate with each beacon activation. The second being you will continue to gather Zerg until one team reaches 100%, meaning it is possible for one team to reach 98-99% progress only to lose control of the beacons and have the opposing team reach 100% . From what I understand,additional Zerg units will spawn for the team that reaches 100%,so it's always in your best interest to be the first team to get to 100% progress. Picture of Braxis Holdout,marking where beacons spawn. On the other side of the spectrum,there is "Warhead Junction", a three-laned map that has teams fight over control of nukes which periodically spawn in random, but fixed locations between the three lanes. The mini map will be marked where the next wave of nukes will spawn and a timer will appear on your HUD when they are ready to be collected. Once captured by a hero, these nukes can be deployed at a certain range that will do heavy damage to structures and units. A hero can only a single nuke at a time and will drop the nuke when they are killed. The interesting part of these type of objectives is that you can still turn things around should you fail to collect the objective. It becomes a game of one team trying to assassinate whoever the collected the objective while their teammates try to protect the holder until they can call in the nuke.